Last week I was digging through some boxes looking for some fine mesh to scale some 3" pikes I was painting. I cam across these little guys hidden in a box. I had forgotten all about them, and apparently never clear coated or finished them. So I clear coated them, ground down some lips and wired them this week. Now to go dig through more boxes looking for #6 and #8 hooks! I am guessing I made these around 2000 or 2001. I was fishing golf course ponds quite a bit in the summer and was dragging my brother along. There was lots of juvenile bait around, and the fish were sometimes a bit finicky. I was having no problem fishing the early incarnations of the 3" pike (then nicknamed the choopy mini), and catching fish. My brother was fishing a lighter rod than I was, and the choopy mini was a bit heavy for his tackle, so I made these little swimmers for him. Apparently I made a little danny and pikie. As you can see, they are pretty small, about the size of two quarters. We were fishing pretty late at night, so the colors were dark. I don't remember much about how they swam, but I do remember my brother beating up on the largemouth's pretty good one night with them. Nothing huge, but a ton of action. I think the imitated the little minnows and other juvenile bait that comes to the surface at night, but I think they also imitated the bugs that were hatching or hanging out on the surface as well. So now I got some new lures to play with. Time to refresh the memory on how these swam and see what I can catch with them. 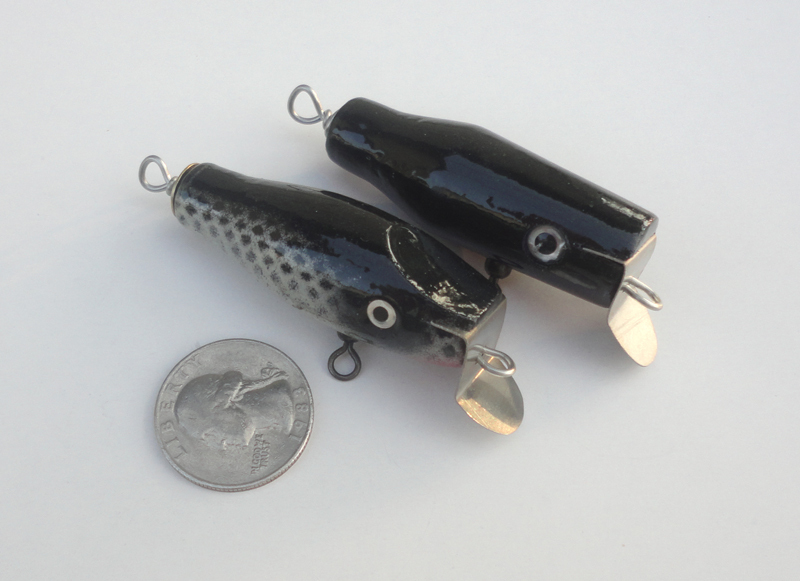 There are a couple spots with big long ears and bluegills, and I think that they might love these. I should go digging through some other boxes and see what else I have stashed away!